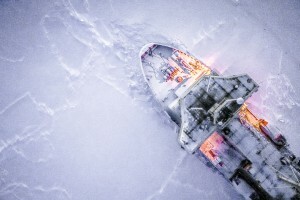 While PIPERS involves primarily water going vessels, the unmanned aerial systems (UAS) team of PIPERS has four unmanned aircraft taking to the skies above the ice. 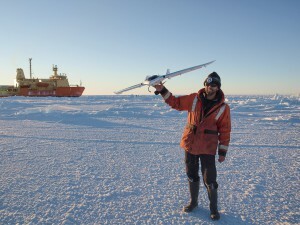 When conditions allow (both weather and ice), the UAS team treks out to the designated take-off and landing strip to add depth to the PIPERS measurements. After updating flight plans, performing final equipment checks for safety, the call is made up to Air Boss Steve on the bridge that the UAS team is ready for launch. Once Air Boss Steve is notified that we want to launch, the bridge will do one final check to make sure that there’s no interference in the ships equipment from the UAS operations. With that check done, the Air Boss will give the notification to the other teams on the ice to be aware of the flying object in the air and then we are cleared to launch. There are two classes of UAS onboard pipers: fixed wing and quadcopters. The quadcopters are launched from the ground, while the fixed wing aircraft get a little push from the pilot’s hand to gain the initial altitude and speed necessary for flight. While the fixed wings look like toy airplanes, they are powerful instruments of science. Within the classes of UAS, they are furthered divided into either Imagery or Meteorological observers. 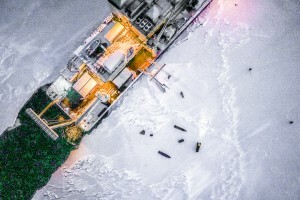 The Imagery UAS work to give an overview of the ice conditions and allow features that are not easily observed from the ground to be resolved. 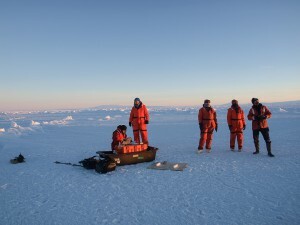 These measurements are combined with the work done from the LIDAR team on the ground and the AUV team underneath the ice to give a complete picture of the structure of the ice flow. 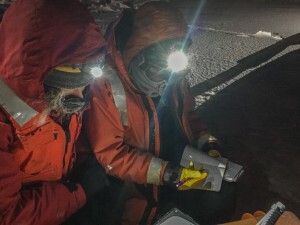 The meteorological observers work to understand how the ice modifies the lowest level of the atmosphere called the boundary layer. While the pilot is in charge of maintaining control and line of sight contact with the aircraft, there is another person (or two) out on the ice for each flight. The ground control person is in charge of the flight plan and communicating to the pilot where the aircraft is in the flight plan, and its condition: altitude, speed and battery voltage. The pilot and ground control person communicate directly with each other, with the ground control person talking to the additional person in charge of radio communications with the bridge. For some of the flights, the ground control person must also update the flight plan to reflect the current latitude and longitude of the landing strip. 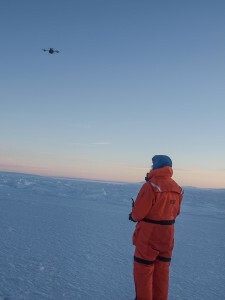 Due to the natural drift of the ice, it’s important that this information is as up to date as possible when initializing the UAS mission. What’s left to eat on Day 59?